New-Life Handyman Services is a locally and minority-owned handyman service that specializes in custom home theater installations, kitchen and bathroom remodeling, interior and exterior painting as well as carpentry and other home improvement services. With more than 37 years of handyman services experience under my (tool) belt, I bring know-how and and skill to your home and business repair job. Whether you need residential or commercial repairs done, I will make it a point to meet with you and analyze the space with the project in mind. As part of your free consultation, I will measure, take photos and more for best results. So call today for your free estimate, and let me do the work for you on your next project! Let me be your ONLY choice for professional home and business repair and remodeling no matter where you live in the Bowie, MD area. Even if you have the skill to paint, finding the time can make even a small job seem overwhelming. Leave it to me to get it done to your satisfaction. I can suggest painting techniques and textures, and you can rest assured that I'll take care of the cleanup too. Experience total escape in your very own home theater. With my experience, I can create a custom design that you and your family and friends will love. Enjoy commercial cinema quality in the comfort of your own home! Plumbing is a common need in any home or business. I can fix a leaky faucet, replace a toilet or handle any plumbing repair. Got a plumbing problem? Call now. Want to impress your guests? Start with the bathrooms. From flooring to fixtures, we can refresh showers, tubs, sinks, and even flooring from top to bottom. Want to liven up a room? I can handle your most demanding flooring needs. As a skilled craftsman, I can install ceramic tile, hardwood or laminate flooring or carpet wherever need be. New switches, outlets, and repairs are quickly and professionally done by myself. Let me add to the ambiance of any room with dimmer switches and save money with motion detecting light switches. Perfect for your home theater! From slip-resistant flooring to tile backsplashes, I can help you create your ideal kitchen. Sinks, disposals, and fixture installations are a great and easy way to update to a modern, more functional work space. Let me take care of putting down your tile floor or repairing broken tiles. I can handle many jobs, from simple grout work to your own designed, decorative, mosaic tile layouts. You have a chore that needs to be completed? Something you've been putting off? I can finish it right and make sure it's done to your satisfaction. Ready to do some updating? 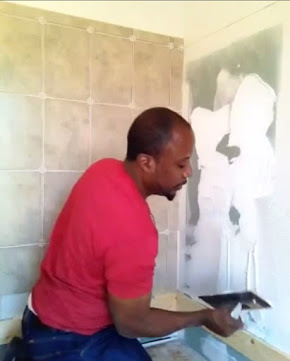 Let me handle your interior or exterior projects and beautify your home. With my skills and experience, I'll leave you with something you'll be proud to show off for years. I have the know-how and the tools to take care of most carpentry needs for your home repair and remodeling needs. I can refinish your existing woodwork, do trim work and even build basic structures like bookcases and entertainment centers to suit your needs.